Today the Valdichiana is administratively divided between the Tuscan provinces of Arezzo and Siena. The Valdichiana takes its name from the ancient river Clanis, which in Etruscan and Roman times flowed from Arezzo to the south until it joined the river Paglia, and finally got into the Tiber. The Valdichiana is described by the ancient authors as the granary of Rome, in fact after the reclamation has become a very fertile land, from the agricultural, artistic and architectural point of view. At least since 1500 the Valdichiana has contributed, in a concrete way to the rediscovery of the Etruscans, with the striking findings of the Chimera, of the statues of Arringatore and Minerva, the bronzes of Brolio and Montecchio Vesponi, the idols of Falterona, the chandelier of Cortona, the necropolis of Lucignano and Foiano della Chiana, the altar of the mound II of Sodo and the “tabula Cortonensis”. And the first Academy, the Etruscan Academy of Cortona, which had been able to revive at European level in the study of this ancient civilization, which was deliberately tied , ideologically, to the Medici family. Today you can see all these works of art in the towns of Cortona, Castiglion Fiorentino, Marciano della Chiana, Civitella in Val di Chiana, Monte San Savino, Lucignano, Foiano della Chiana, in the city of Arezzo and in particular in their museums. 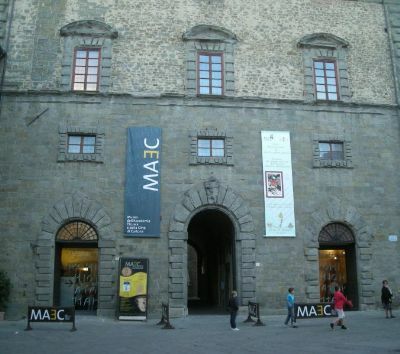 MAEC - Museum of the Etruscan Accademy and the City of Cortona, opened on September, 2005. It has a double personality: the 18th Century archaeological culture, with the ancient and most prestigious collections of the Academy and the modern, cutting-edge from the educational -expositive point of view (thanks to the continuum of glazed areas, to the numerous media support, the reconstructive plastics, to the translucent screens suspended from the ceiling and a tactile path for the blind) of the new museum spaces of the Museum of the Etruscan and Roman City of Cortona. Museum of Media of the City of Arezzo, placed in the Town Hall, covering an area of about 500 square meters with an adjoining auditorium with 100 seats. Here you will discover the history of everything that is part of our daily life: COMPUTER, MOBILE PHONE, TELEPHONE, RADIO, CINEMA, CAMERA ... are just some examples of what you could observe, experience first-hand and with whom you can have fun in the “experience hall”! The exhibition follows a historical - educational excursus particularly challenging for school groups of all ages. A unique museum in Italy for the variety of issues and the care used to deal with each one of them. The Tower of Marciano is a multipurpose cultural center located in the heart of the Valdichiana. A careful restoration has preserved its medieval character, returning to visitors an evocative and unique ambience: from the great Hall "Leonardo da Vinci", to the Halls "Giorgio Vasari", "Cosimo de 'Medici" and "Vittorio Fossombroni"; from the scenic walkway, the "terrace on the Valdichiana" which opens on the landscape from a height of 40 meters to give a breathtaking view over the whole valley until Lake Trasimeno. Inside is housed the permanent exhibition on the "Battle of Marciano" (August 2, 1554), depicted in the famous fresco by Giorgio Vasari in the Salone dei Cinquecento in Palazzo Vecchio in Florence. Civic Archaeological Museum of Castiglion Fiorentino. Opened in 2001, the museum collects finds from excavations carried out since the end of the eighties and tells the story of Castiglion Fiorentino and its territory since the Etruscans, the Middle Ages to modern times. Museum of Lucignano, opened in 1984 in the ancient seat of the Tribunal in the Town Hall, in addition to religious art works of the 13th and 18th Century offers, in the same spaces, a splendid cutaway of local history. The main work of the Museum is the great reliquary of San Francesco, in silver, gilded copper and enamel, called the "Golden Tree", realized between 1350 and 1471 by goldsmiths of Arezzo and Siena, unique testimony of popular devotion, and one of the greatest masterpieces of Italian goldsmith's. Church / Museum of the Fraternity of Santa Maria - Foiano della Chiana. The church within the walls of the castle of Foiano was born as oratory of the Fraternity founded in 1392. The present church (early 17th Century) preserves the beautiful statue of the Madonna and Child by Andrea della Robbia (1460 ca.) and paintings of the 16th, 17th and 18th Centuries by Orazio Porta, Sebastiano Folli and the school of Camillo Sagrestani. Museum of the Cassero - Monte San Savino. The collections are displayed in the Cassero, a fine example of medieval fortification, built by the Sienese between 1382 and 1384 under the direction of the architect Bartolo di Bartolo. Monte San Savino is a center of ancient ceramic tradition, particularly specialized in the production of everyday objects. The museum wishes to recover and valorize the strong, popular tradition of the area, it serves the needs of documentation, protection and reorganization of folk pottery of the Chiana Valley and is a necessary link and reference to the shops still operating in the town, to recover factual values, morphological and decorative heritage of traditional production of Monte San Savino. The Contemporary Art Gallery - Civitella in Val di Chiana, founded by the efforts of the Pro Loco, owes its formation to the works acquired over the years by the “Premio Nazione di Pittura Città di Civitella", born in 1964, and the sculpture exhibition “(S)oggettivamente Arte Moderna” for an ancient village began in 1976. The gallery, which opened in 2006, features 98 paintings and 41 sculptures and then continues on an outdoors path along the streets of the village. By purchasing a ticket for one of 8 museums participating in the project, you will receive the MUSEUMS OF VALDICHIANA CARD which entitles you to discounted tickets in the other museums. Find out where to to spend an holiday in Valdichiana immersed in art, history and nature.